Wrapped up my third and final fantasy draft Sunday night. With some decent variety among the three leagues — 15-team mixed experts league draft, 18-team mixed home league auction, 13-team mixed home league draft — a bunch of different trends emerged. For our purposes, though, we’re looking for common themes. If you have a draft coming up some time between now and opening pitch at 3:10 am EST from Japan (or between now and Marlins-Cardinals April 4), here are some patterns I’ve noticed, as well as a list of players I’ve drafted multiple times. • Don’t bother bidding on Brett Lawrie. The Jays third baseman went for $26 in last week’s auction. In Sunday night’s draft, he went an amazing no. 36 overall, ahead of reliably great commodities like Paul Konerko, Felix Hernandez, and Cole Hamels. Lawrie has played exactly 43 games in his major league career. Even if you’re convinced he’s a future superstar, by drafting him late third round in a 12-team mixed league or paying more for him than you would an established ace, you’re eliminating all or most of the potential for value. If you insist on a blue chipper at third base, make it Evan Longoria. If you want a true sleeper, and your league eligibility rules have him qualifying at third, try Mat Gamel. Right. No one. Any pitcher who can throw bulk innings, vie for top-10 ERA honors (13th in the AL last year at 3.32), and keep runners off base by being that stingy with walks has a chance to produce big value. Go get a less-heralded pitcher with a gaudy strikeout rate to balance McCarthy’s relative lack of Ks (Bud Norris works), then reap the benefits. • You’re probably not getting Josh Hamilton. The Rangers slugger has missed 143 games over the past three seasons. He struggled for most of last year’s playoffs while playing hurt. He’s missed time this spring with hernia and heel injuries. He’s never stolen double-digit bases in a single season, and isn’t likely to start this season. Now in his 30s, he’s unlikely to get any better at this age, limiting his upside. Yet Hamilton is still fetching superstar prices at the draft table. He went 28th overall in both the 15-team experts league and the 13-team home league. Hamilton was a fantasy (and real-life) terror two years ago, hitting .359 with 32 homers while playing in just 133 games, so maybe people are drafting on the hope that he could be truly unstoppable if he finally plays in 150-plus. Maybe I’m a pessimist, but I don’t see it. Give me a reliable ace like Felix or CC Sabathia at that point in the draft over a talented question mark like Hamilton. 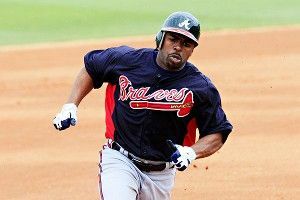 • Michael Bourn: Seemingly everyone loves power and underrates speed, and I want value above all else. If anything, drafting Bourn (whom I own in all three of my leagues) allowed me to focus on other categories thereafter, without sweating the cheap steals guys everyone desperately targets at the end. In LABR-mixed, taking Bourn early (no. 45 overall) helped me turn off my speed radar, which led to what could be a monster pick in the first reserve round: Francisco Liriano. • David Ortiz: The other player I own in all three leagues, presumably because people hate to clog their utility spot too early, for fear of getting boxed in on roster decisions late in a draft or auction. I’m sympathetic to that idea, but only to a point. Ortiz hits in the middle of what was baseball’s best offense last year. He’s not quite the Big Papi who put up cartoonish numbers during the height of Boston’s pennant runs, but he’s still averaged more than 30 homers and a shade under 100 RBIs in the past two seasons, due to a combination of his own skill and the on-base hounds hitting in front of him. And yes, Ortiz’s lack of position eligibility has created an overreaction that’s netted some good value, including the 105th pick in LABR-mixed. • Ian Kinsler: He’s a late first-round pick for me in any deepish league. Many experts rank him below Robinson Cano and Dustin Pedroia at second base and behind multiple sluggers, presumably due to batting average. I’m not afraid. Kinsler hit just .255 last year (thanks to a flukishly low .243 batting average on balls in play; league average is in the .290s), but that was after hitting 31 points higher a year earlier. The most encouraging sign for Kinsler’s batting average upside was his career-low 9.8 percent strikeout rate last year, 13th-lowest in the majors in 2011 (Kinsler had the lowest batting average of any of those 13 players, and five of the 12 players above him hit .290 or better). If you want to also sweat Kinsler’s past injuries, that’s a fairer criticism: Kinsler played 144 games in 2009 and 155 last year, but just 103, with a career-low nine homers, in between. Still, this a second baseman who went 30-30 with 121 runs scored last year, batting leadoff for one of the league’s most potent offenses. There’s far more overall upside on Kinsler than, say, Hamilton, even if the two players aren’t going that far apart. • Bud Norris: The following pitchers posted lower strikeout rates than Norris: Roy Halladay, C.J. Wilson, Josh Beckett, Cole Hamels. No one’s suggesting Norris is as good as those pitchers, or even in their class. But Norris’s lack of name value and the fact that he plays for a potential 100-loss team have prompted people to ignore a pitcher with very good peripheral skills. Wins are really tough to predict in fantasy anyway. Might as well grab a guy like Norris in the 22nd round, rack up the strikeouts and respectable ratios, and let the wins fall where they may. • Matt Joyce: You could say I’ve followed both his career and his team’s fortunes closely. You could also say that Joyce whacked 19 homers and swiped 13 bases in his first turn as a (nearly) full-time player, that he’s at an age that’s smack in the middle of many players’ peak (27), that he’ll be hitting in an improved Rays lineup, and that he’s reportedly fully recovered from a shoulder injury that lingered for a good chunk of last season. Best of all, he’s going late enough to make him a potential bargain (no. 166 and no. 171 in my two drafts). • Lance Lynn: Something of a hunch bet, and only recommended for deeper leagues. Still, Lynn owns a solid minor league track record, fared well in 34 innings as a rookie last year (including a 10.4 K/9 IP rate, albeit mostly as a reliever), and has shown solid command (3-to-1 strikeout-to-walk rate) during spring training, something you’d normally ignore, but which might be more relevant for a pitcher stretching out to starter’s innings this year. Between Chris Carpenter’s injury, Jake Westbrook being Jake Westbrook, and my general bias toward National League pitchers in a mixed league, Lynn could be a solid find in the late or reserve rounds of a deep league. Other players I drafted multiple times: Mariano Rivera (Craig Kimbrel and other younger, sexier closers are going considerably earlier, but Mo’s as reliable as they come); Matt Cain (the rare pitcher who might defy DIPS theory, at least a little); J.P. Arencibia (25-homer power from a catcher is swell, just make sure to insulate your batting average elsewhere); Chase Headley (rare, cheap steals from a third baseman, and a good age for a mini-power breakout).